The big picture: According to StatCounter, Windows 7 is still used on 33.89 percent of desktop Windows machines worldwide. That figure is expected to drop considerably as the OS reaches the end of support and users upgrade to Windows 10 which has a current Windows market share of 54.78 percent. Microsoft earlier this month said that beginning in April, it would start informing Windows 7 users about the impending end of support date. The update that’ll enable these friendly notifications has already started rolling out according to Microsoft. 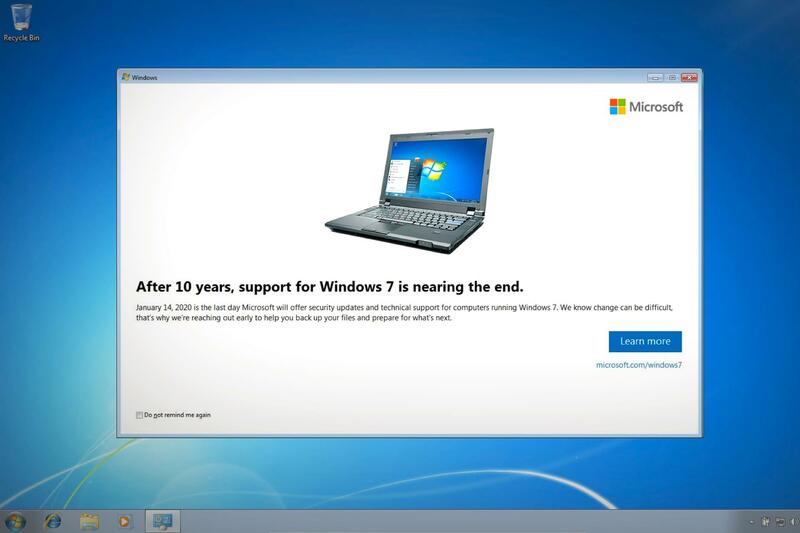 The aforementioned notification, set to start making its presence known on April 18, informs users that after 10 years, Microsoft is ending support for Windows 7. The official end-of-life date is January 14, 2020, so you’ve still got some time to back up your files and plan your move to Windows 10, macOS or whichever platform you aim to adopt in the future. For many, the route forward will indeed be Windows 10 and in all likelihood, updated hardware will also be in order. Learning from previous missteps, Microsoft’s reminder will arrive with the ability to silence future notifications. The tech giant, if you recall, went a bit overboard with its Windows 10 upgrade campaign, with some classifying its nagging approach as borderline malware-like.